What could be better than a cookie that combines the 2 things that I love the most? Not much! LOL! By now, most of you know that peanut butter and chocolate are near and dear to my heart. They rank right up there with my husband, kids and my wine. 😉 So, it was a no brainer that I had to try a recipe for a cookie that combined PB and chocolate. These cookies were so unbelieveably easy to make and so worth it. They are the perfect ratio of peanut butter to chocolate. This recipe is supposed to make 48, mine made 37 and I can’t guarantee how long they will be around for. The kids both loved them. I am going to freeze some, but I don’t know how long they will last there, either, unless I forget about them. 1. Heat oven to 375. Remove wrappers from chocolate (you may want to not unwrap all 48, as this recipe didn’t make that many cookies for me ~ I got about 37). 2. Beat shortening & peanut butter until well blended. Add sugars and beat until fluffy. Add egg, milk & vanilla; beat well. 3. Mix together flour, xanthan gum, baking soda, salt and then mix into wet into peanut butter mixture. Refrigerate dough for 30 – 60 minutes. 4. Shape dough into 1-inch balls. Roll in granulated sugar; place on ungreased cookie sheet. 5. Bake 8 – 10 minutes or until lightly browned. 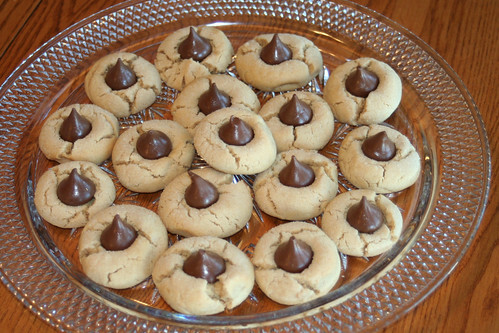 Immediately press a Hershey’s Kiss into the center of each cookie; cookie will crack around the edges. Remove cookie to wire rack. Cool Completely. Makes about 4 dozen according to the recipe, I got 37. Maybe yours only made 37 because you ate the other 11 kisses? Ha ha…aren’t you the funny one! LOL! 😉 I have plenty of kisses left over, they are in my ginormous bowl of Halloween candy that I hope makes it until next Friday or I may be doing some last minute shopping for treats to hand out! Those look great! Thanks for the recipe. 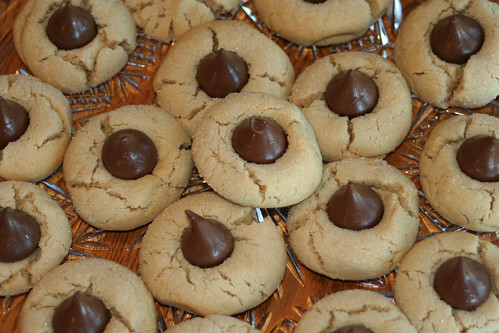 These are my husband’s favorite Christmas cookies and I have been looking for a good g-f recipe for them since this is his first Christmas with Celiacs. One question, though – is your g-f flour mix equal parts tapioca, rice, and potato starch or some other ratio? Thanks! Use cup for cup for regular flour. Don’t forget to use Xanthan Gum (1 tsp per cup of flour used in your recipe). I hope this helps! I just had a couple of these from the freezer last night. YUM! I am a little late to this party 🙂 but I wanted to tell you THANKS SO MUCH for posting this recipe! I found it on a different site (examiner.com), after doing a search looking for this specific recipe Gluten Free. Although I do a great deal of GF baking for my older son who is Gluten intolerant, I was skeptical that these would turn out like the originals. Much to my delight, I found they are even BETTER!! The texture is way more tender and melt-in-your-mouth than the Gluten version. I used a brown rice flour mix (Annalise Roberts’ blend) for my flour sub. And the cookies are still awesome the next day! Not sure how long these will last, but I plan to freeze at least some to enjoy later! Thank you. Great article you got here. Have some more links to direct to which have more information? I am pleased to hear that you like them! I just made this and I’m blown away… these are UNREAL. I made them exactly to the recipe (changed nothing) and they were perfect. 8 minutes was good for me for the baking time and my recipe made 39 cookies. Thank you so much for this, my mother has been gluten-free for six years now and we haven’t had these in so long! Trying this recipe but I sure wish you had mentioned at the beginning that you need to refridgerate the mix 30-60 minutes before baking as that is way too long to preheat an oven! Has anybody tried these with Coconut Oil instead of shortening?